As a mom and a teacher, I know that there are many valuable life lessons that we try to impart with our kids (and students) each day. With two girls merely 15 months apart in age one of the lessons I have spent a great deal of time on is "sharing". From sharing toys and their room to sharing mommy and daddy's attention - it's a lesson we touch on numerous times a day. We share with those we care about and we share to show we care. It starts in our home but it doesn't end there. I try to teach my girls the importance of sharing through my own actions. It's about showing kindness and putting others first. I try to model this as much as possible for my girls by helping family and friends in need, helping in our community, volunteering at their school and regularly providing their teachers with items that are needed for their classrooms. How do you not only show you care but teach your children to care as well? Kleenex has an amazing new Softness Worth Sharing initiative that let's you show you care to a friend, family member, co-worker, teacher, or even a stranger - it's entirely up to you! 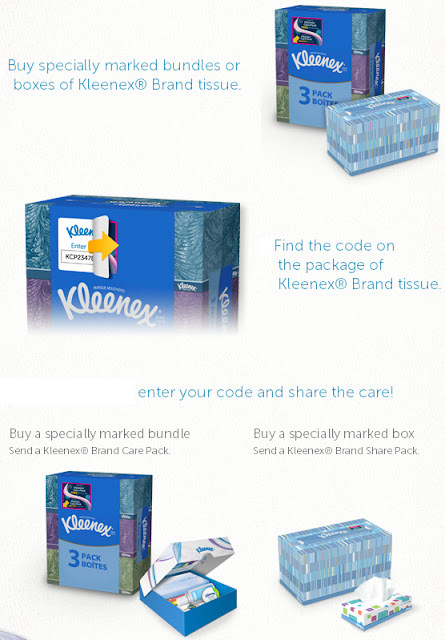 Showing you care with Kleenex is as easy as 1,2,3! Purchase a specially marked box of Kleenex Brand tissue. Find the code and enter it online. Then share the Kleenex Brand Care Pack! The Kleenex® Brand Care Pack includes: lip balm, 1 oz. hand sanitizer, coupon booklet, Kleenex® Brand Share Pack, Kleenex® Brand Slim Pack, and a card redeemable to download four songs from up and coming Universal Music Artists including: Andy Grammer, Miloš Karadaglić, Avi Avital and Rebecca Pidgeon. So go on, share a Kleenex Care Pack with your family, friends, co-workers, teachers or even a complete stranger. I’m sure you’ll brighten someone’s day. Who would you surprise? 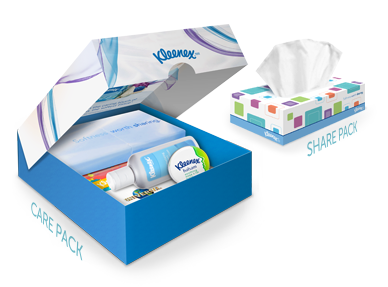 Find out more about the Softness Worth Sharing initiative on Kleenex's website and join them on Facebook. Disclosure - I wrote this review while participating in an ambassador program by Mom Central Consulting on behalf of the Kleenex brand and received product samples and a promotional item to thank me for taking the time to participate. Of course, sharing - one of the most important yet more overlooked lessons a kid can ever learn. I honestly had to get a little creative with this one. I did get tee pees for both my son and daughter, but I often make it a point to hide one so they're forced to share what's available.